Wedding parties love our trolleys for unique wedding transportation! Make your getaway in style! Make Your Getaway in a Trolley! 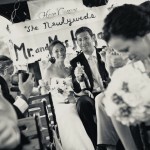 The trolley is a newlywed party limo! Great for unique wedding pictures! 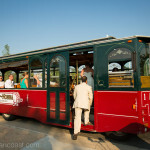 Transport guests from ceremony locations to reception in a way they’ll love! Check out our gallery for ideas on using our trolleys for your special event, wedding transportation, wine tour, and more! For information and availability, please contact us at (888)785-6377, or email us at info@sunsetcoasttrolley.com!